It is with great pleasure that we introduce to you today and unveil the newest member of the Weber family, the Summit® charcoal grill! After several years of testing and development thru hundreds of hours of lab and field work, we are so excited to finally share it with everyone. What is the Summit® charcoal grill? It is the evolution of charcoal grilling. 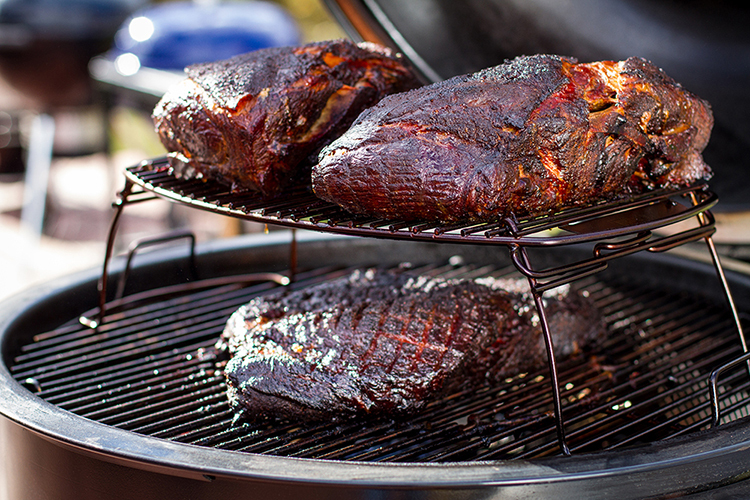 We have taken the greatest benefits of three of our best products, the Original 22" Kettle™, the Performer®, and our Smokey Mountain Cooker™ smoker and have combined them into one exceptional product. The new Summit® charcoal grill takes the guesswork out of charcoal grilling and brings our consumer the very best in design, functionality, and performance. What makes the Summit® charcoal grill so special? It has some very unique features only found on this product. Starting with a double-walled air-insulated porcelain enamel lidand bowl. The air acts as an insulator keeping warm air in and cold air out. It also comes with a new and innovative lid damper, that acts like all other Weber lid dampers, with the addition of a hinge, allowing it to flip open acting similar to a built in chimney starter. This helps light your fuel quickly and easily. The lid thermometer is the largest one Weber has ever offered that now includes key grilling temperature zone indicators further eliminating any guesswork at the grill. Inside, the large 24" hinged stainless steel Gourmet BBQ System™ cooking grate allows the option to use a variety of Gourmet BBQ System™ cookware pieces including a wok, griddle, sear grate, pizza stone, or poultry roaster giving you unlimited versatility and options at the grill. A new and innovative hinged diffuser plate is included and is used for low and slow applications. It's made of two layers of durable stainless steel that have an air gap between the layers helping to regulate the heat inside of the kettle. A new smoke/low-and-slow vent setting located on the ash ring sets the stage for extremely long smoke times. Just "set it and forget it". 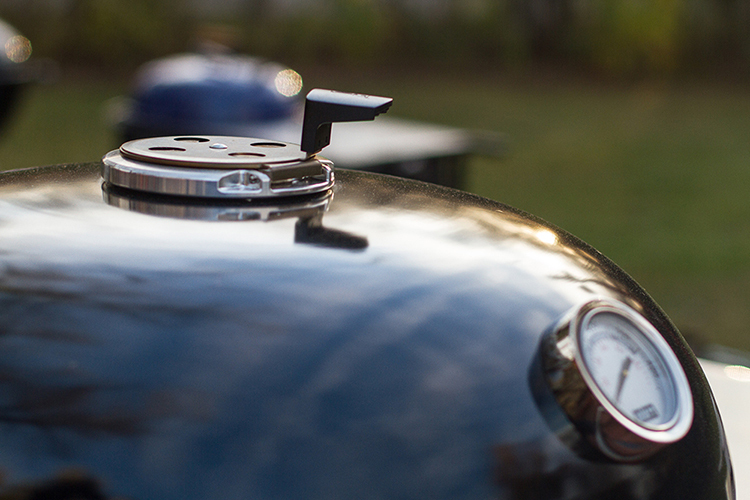 And with the addition of gas assist, lighting charcoal is a breeze, allowing you to be up and running and ready to grill in just 20 minutes. What does all of this mean for you? Power, flexibility, versatility, confidence, and unbelievable food! The Summit® charcoal grill comes in two models, the Summit® charcoal grill, and the Summit® charcoal grilling center. The grilling center includes everything that the Summit® charcoal grill has with the addition of a built-in stainless steel side table, perfect for placement of food or for prep space. It also has a large sealable Char-Bin™ storage container suitable for holding a 20-lb bag of fuel, a diffuser plate storage area located underneath the grilling center, and a removable basket that can help tote a few things to and from the kitchen! We have also launched a number of new charcoal accessories including specific covers for each model, a new charcoal rake, an expansion grilling rack, and a large rib rack. To find a retailer near you that carries the Summit charcoal grill and these accessories, please click here. So why does one need the Summit® charcoal grill? I am fortunate enough to own several Weber grills, including a Kettle™, a Performer®, and a Smokey Mountain Cooker™ smoker. They are all wonderful products that I use all of the time. I also have a Genesis® and Summit® gas grill. Like many others, I tend to use the gas grills during the week, and my charcoal grills on the weekend, simply due to time and convenience. This grill gives you the opportunity to use charcoal every day because of how fast it gets you up and running, similar to a gas grill. I've had the privilege of eating everything off of this grill including steaks, ribs, shoulder, brisket, fish, pizza, whole chickens, vegetables, and cakes! (Yes, cake!). Everything has been amazing and some of the best food I've ever had off of a Weber. As our Grill Master Kevin Kolman states, you feel invincible on this grill. It gives you confidence like no other. I've only highlighted a few of the key features of this grill. We have a lot more information about the Summit® charcoal grill on our website. We will post some incredible videos from Mike Lang showing the versatility and power of this product. I encourage you to take a few minutes and watch these and get familiar with this product. Once you decide to purchase this product, please make sure you register this grill. Once registered, you will receive a free beautiful hard covered Summit® charcoal grill cookbook where every recipe was specifically developed for this product. It is an exceptional gift from us and the recipes are outstanding. Today is a special day for Weber. George Stephen would be so proud of this grill and where we have taken charcoal grilling from where it all started in 1952. George may be gone, but his spirit certainly lives on in the Summit® charcoal grill. We are confident you will all agree! For more information about the Summit® charcoal grill click here!